Mexico isn’t as cheap as one would expect/hope. But some things are free. Snorkeling in Akumal, and swimming with turtles, is! When you stay in Mexico, and have the chance to make it to Akumal, in Yucatan, you can swim with turtles. For Free. Or as good as free. And if you take a couple of guidelines into account, it will be fun and safe! The easiest way to get to Akumal, is by taxi. But it’s not the cheapest one. Your cabbie will drop you at the entrance of the beach. The bus gets you to the pedestrian passage over the highway. That’s 1.5 kilometer (a mile) from the beach entrance. You can park your rental car not too far away from the entrance, and I saw price signs indicating 80 pesos for a day. Once you get to the entrance of the beach, you go under the arch. If you take right there, you’ll walk direct towards the Akumal dive shop. In front of it is a ship-free area where you can go and snorkel, or you can walk along the beach and find yourself a spot where you hope to find the good spot. You’ll need a life jacket, snorkel and mask and fins. The life jacket is not only for your safety, but probably as much for the animals. As everybody wears one, the bottom of the water is reserved for the animals. All humans float together at the surface. No one steps on turtles or on other animals. And it’s nice to know you have a jacket, as some people can be intrigued by the underwater life and float further away from the coast than they first anticipated. Snorkel and mask, as well as the fins speak for themselves. Don’t bring big fins: the distance is short, and it can get crowded at moments when groups get in and out the water. I brought my Dry Case Backpack to put my clothes and telephone. As it’s a waterproof one, I did take it with me while snorkeling, so I didn’t had to leave stuff at the beach. Another option would have been to rent a locker in one of the diving places here. The Akumal Dive Shop on the beach can rent snorkel, fins, mask and jacket to you. They have showers and lockers if you need. You leave ID with them, and for a couple of dollars, you’re on your way for the rest of the day if you like. Of course, the turtles are the main attraction here. When snorkeling, you’ll see them feeding on the see grass. Just relax, hang in, don’t move your feet and wait. After a while, the turtle will need air, and make its way up to the surface to get some air. That’s when they come up and close. It’s really swimming with turtles at these moments. 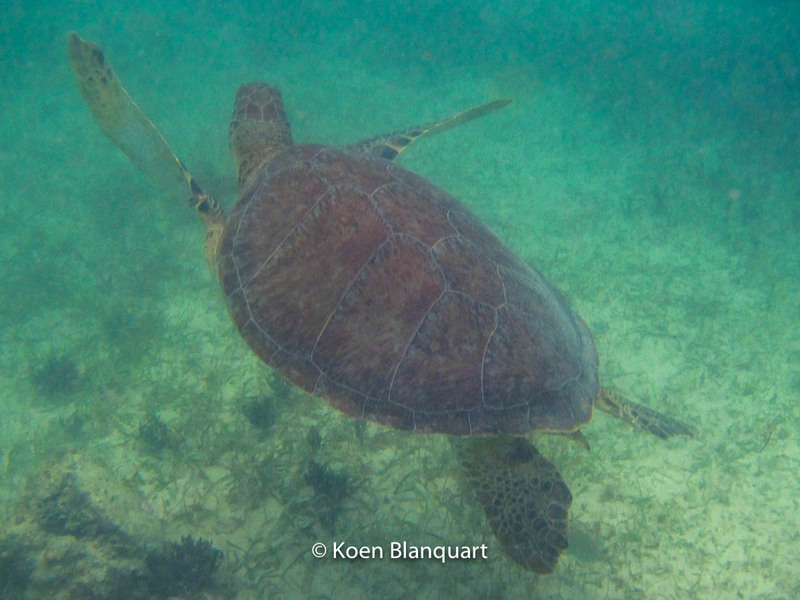 Akumal is not only famous for the turtles. 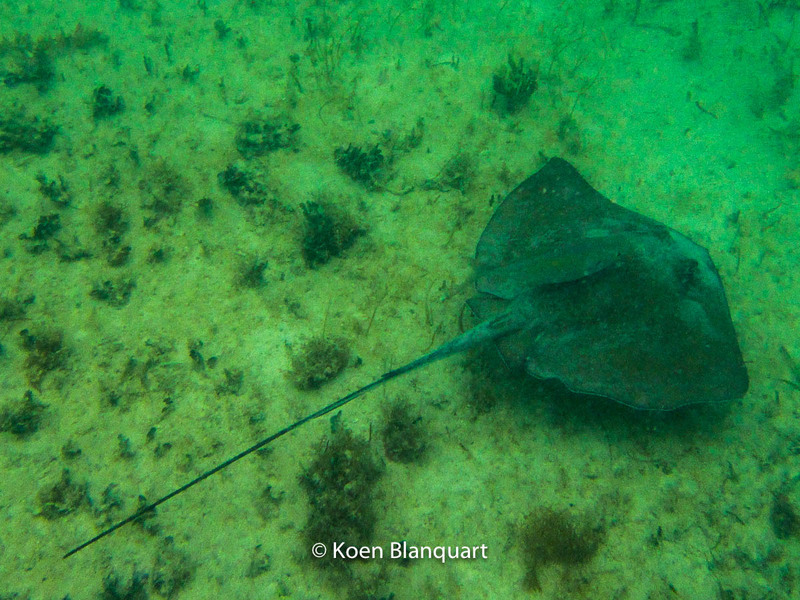 In the shallow water near the beach, stingrays feed near the bottom. These fish are not dangerous by itself, but if you would step on one, they would defend themselves. Here’s another reason to ear a safety jacket. The jacket will let you float, and avoid the need to use your feet and to step on one. So the swimming with turtles is also a swim with stingray and other fish. Local people who I spoke to there, also informed me that you can be lucky and see moray eels, barracuda ad groupers. I haven’t seen these here, but as they were present in Cozumel, I see how this is very possible. The proximity of the turtles, means there are nests. All along the Americas, these are now being protected better than ever before. Organizations such as Sea Shepherd have volunteers in some countries to protect the nests from poachers. Everyone who comes on a beach where turtles might nest, is co-responsible for the preservation of the species. Any item left on the beach could get entangled in a turtle (adult or young) and kill it in the short or long term. Any piece of plastic could be seen by a turtle as a jellyfish, eaten and could mean its dead. It’s a small effort to take away all you find on the beach, and contribute to the turtles well-being. Swimming with turtles is so much more fun with them around. Beautiful post! I really appreciate the turtle best warning… People walk all over them sometimes! Thanks for reminding people to be responsible with trash when traveling and visiting the turtles! It’s great we have this opportunity to experience turtles, and we need to make sure we preserve the environment too.